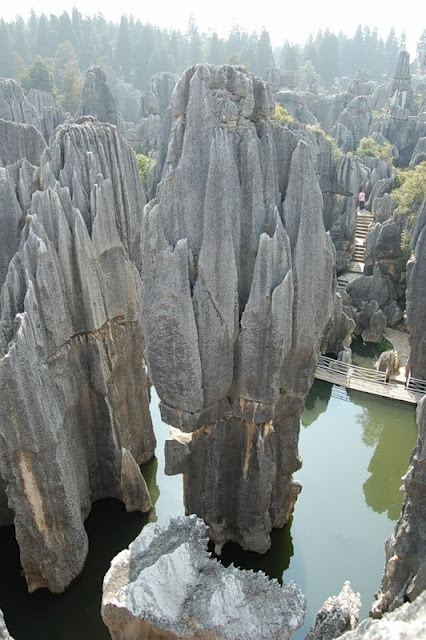 The Stone Forest or Shilin is a notable set of limestone formations located in Shilin Yi Autonomous County, Yunnan Province, People's Republic of China, near Shilin approximately 120 km from the provincial capital Kunming. The tall rocks seem to emanate from the ground in the manner of stalagmites, with many looking like petrified trees thereby creating the illusion of a forest made of stone. Since 2007, two parts of the site, the Naigu Stone Forest and Suogeyi Village, have been UNESCO World Heritage Sites as part of the South China Karst. The site is classified as a AAAAA-class tourist site.